West Coast in the house! 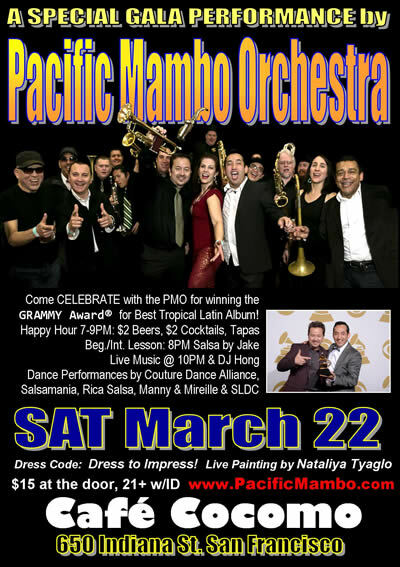 This Saturday March 22 marks the first hometown SF appearance by the Pacific Mambo Orchestra since their Grammy® win. There will be many local musicians and dancers on hand to celebrate with. 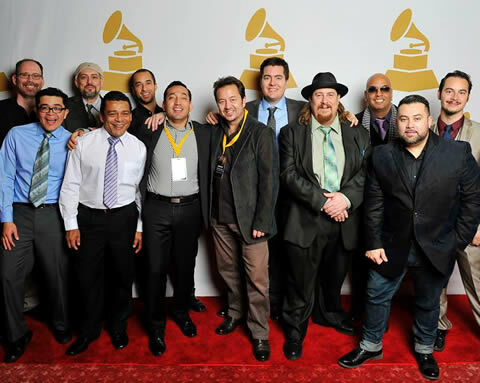 This is the first time in the history of the awards that a salsa band from San Francisco wins the Best Tropical category. The show will also feature dance performances by Couture Dance Alliance, Salsamania, Rica Salsa and Manny & Mireille & SLDC plus DJ Hong. 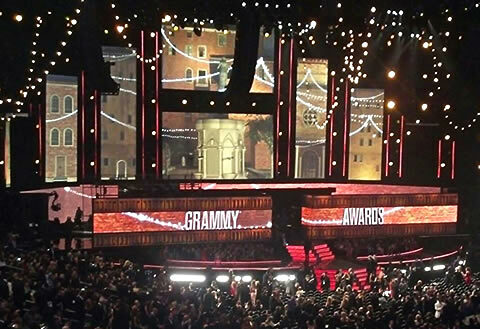 Grammy® membership applications will be available at the door. 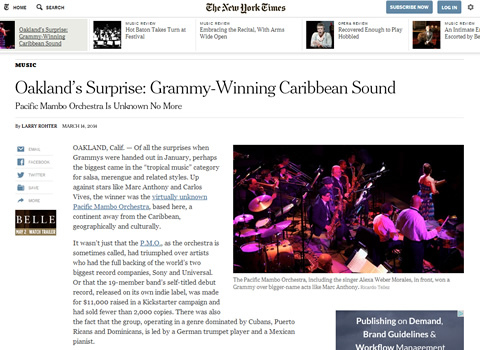 Pacific Northwest - Philadelphia - San Francisco - Texas - Washington D.C.
"Oakland’s Surprise: Grammy-Winning Caribbean Sound" .... check it out. 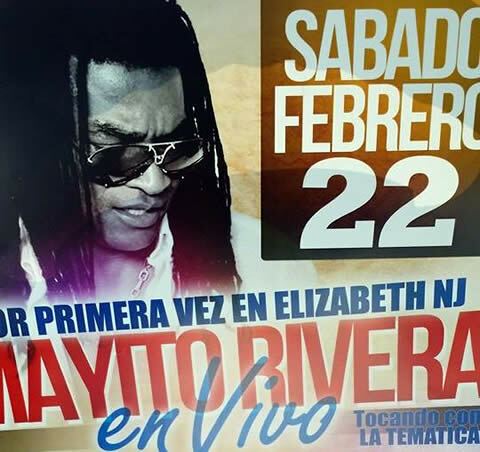 Ok get ready for MAYITO!! 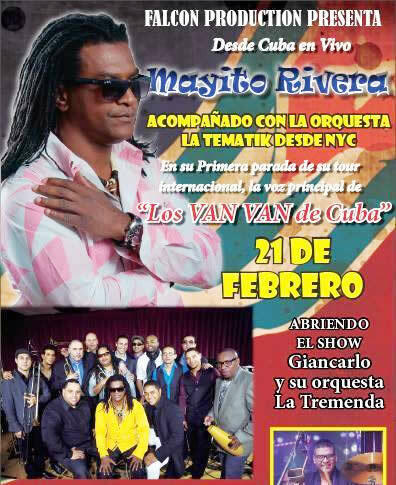 "El Poeta de la Rumba" will be in San Francisco SATURDAY February 15 with Timbalive at the 2014 SALSA RUEDA FESTIVAL. This is at the Hotel Whitcomb downtown SF. After that you can catch him with Jhair Sala and Sebastian Natal and their crew LA TEMATI-K in Woodbridge, Virginia at The Palace Nightclub ( 703-490-3814 ) on Friday the 21st and in Elizabeth, New Jersey at Mi Tierra ( 917-459-0014 / 908-422-3088 ) on Saturday the 22nd. While Mayito heads over to the East Coast, the West Coast keeps the party going with the first of a series of GRAMMY® Award Grammy celebrations. 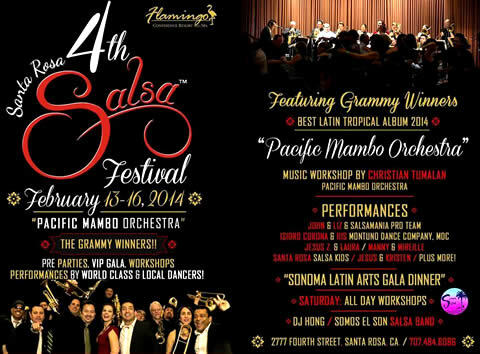 The PACIFIC MAMBO ORCHESTRA headlines the Santa Rosa Salsa Festival this Saturday February 15 at the Flamingo Hotel. 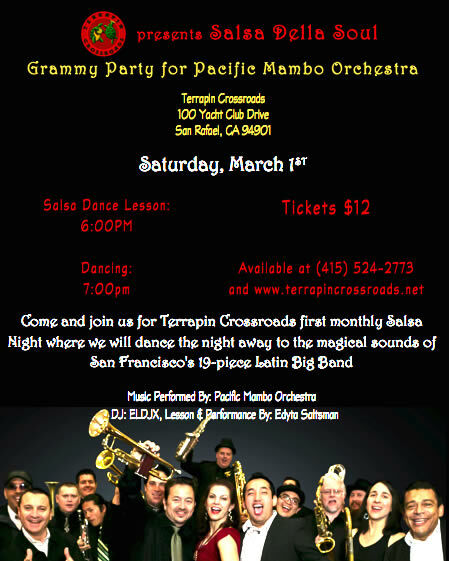 After that you can catch them celebrating at Terrapin Crossroads on Saturday, March 1 in San Rafael. First thing to say about the Grammy Award Show is that experiencing the event live is very different than watching it on TV. This year things really got started when Robin Thicke joined classic rock band Chicago for some powerful showmanship and HORNS! Real live music finally brought a sense of satisfaction. The sound quality was really good, pleasant yet powerful without being harsh. What you would expect from the music industry's top show. They got that right. 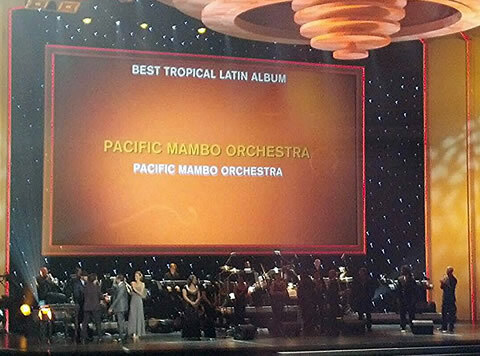 On the Cuban music front... members of the San Francisco based, 19-piece Latin big band the PACIFIC MAMBO ORCHESTRA are still pinching themselves after defeating Salsa icons Marc Anthony and Sergio George - as well as Colombian pop star Carlos Vives - by taking the 2014 Best Tropical Latin Album Award. It was an honor for these independents to be included, but after this win there will be plenty of head scratching over at Sony Music Latin and Sergio's camp. You can read a review of their well-crafted, self-titled debut release here. For many then, the PMO pulled off something truly unique and special. The Mambo is back for real with their full, rich sound and clever arrangements. It seems they couldn't set the bar any higher for themselves. 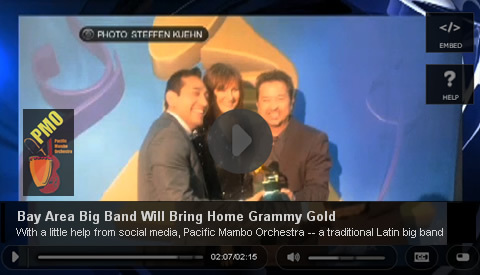 It will interesting to see how the Pacific Mambo Orchestra follows this up. 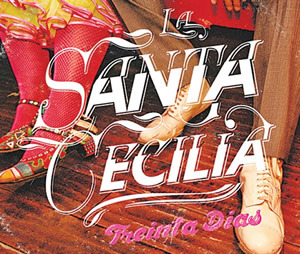 In related news, La Santa Cecilia, a Los Angeles based rock / alternative band that mixes boleros, cumbia, bossa nova and Cuban music won for Best Latin Rock, Urban or Alternative Album. LSC is signed to Universal Music Latino. Their winning album is called "Treinta Días" (30 Days). 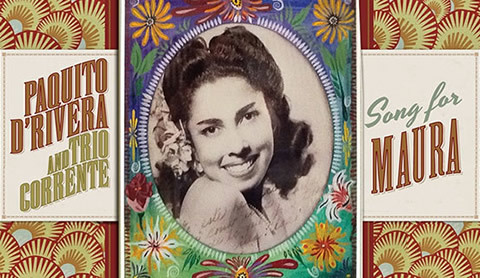 The independent, Brazilian music release "Song For Maura" from Trio Corrente (piano - bass - drums) and Cuban clarinetist / saxophonist Paquito D'Rivera won for Best Latin Jazz Album. Also worth mentioning is the Clavo Records release "Pensamientos for Solo Alto Saxophone and Chamber Orchestra", which won for Best Instrumental Composition (the late Clare Fischer composer, Clare Fischer Orchestra performing). Clare Fischer composed the famous Latin Jazz standard "Morning". Clare's son claimed the award and in his moving speech mentioned that signing an acceptance for a Grammy Award was the last document his father ever signed. Here are some selected PMO photos from the Nominee celebration, Grammy pre-telecast & telecast.